It appears we're having a TMNT weekend! 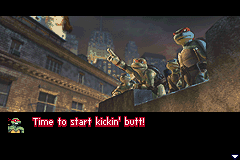 I might as well post an old review of the console TMNT games tomorrow to wrap everything up! This is a very short review for a very short game, so there's no need to be so verbose (like I usually am). Here's my retro review of TMNT for the GBA! With the upcoming release of Teenage Mutant Ninja Turtles: Re-Shelled for Xbox Live Arcade, I thought it’d be a perfect time to look at a game that many have overlooked. I’m guilty of this, too. 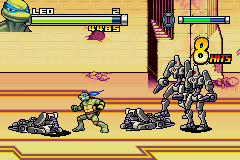 It’s the Game Boy Advance version of the TMNT movie video game. I picked it up recently, and here’s my quick thoughts on the game. Does the Ubisoft connection make this a poor effort or not? 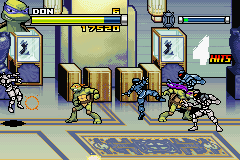 TMNT for Game Boy Advance is completely different from the console and DS versions of the game. 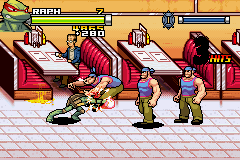 While its big brothers are trying new game mechanics out, the Game Boy Advance version sticks with what's tried and true-- pure, side-scrolling beat 'em up action. 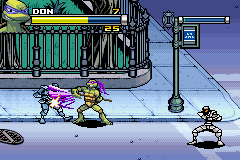 Some levels will require you to play as a certain turtle, but for the most part all four turtles, Leonardo, Michaelangelo, Donatello, and Raphael are available to play as. There's weapons and breakables that each turtle can use to beat up bad guys with or feel the blunt side of instead. Enemy AI is smart as enemies will happily attempt to surround you or pin you to a corner of the screen. Each of the four turtles has their own stats from power to speed, defense to stamina. These stats can be increased via items that can be purchased in between acts. There are seven levels, or acts, in total. Each level spans about 5-10 minutes. It all adds up to a short game for many. While you're in between missions you can browse your lair, look at the trophies you've earned (collected by performing certain actions in-game just like achievements. e.g. beating 100 foot soldiers, earning over $1000), use the gold you've accumulated to purchase character upgrades, extra credits, and more, and meet up with April O'Neil or Casey Jones for some combat-related mini-games. Boss battles vary from Turtles in Time and games of its ilk as you can’t just pummel on the boss to damage him/her/it. Instead, you have to wait until the enemy is open for attack, smack with your weapon, and then go back to waiting for another opening. Each act ends with a different boss to battle, some easier than others, but all with predictable patterns. It's needed variety from just bashing baddies to and fro. 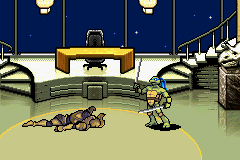 Visually, TMNT is quite a good looker with beautiful 2D sprites and backgrounds, and while the music is forgettable, it fits the action nonetheless. Each act is prefaced by still frames of the 3D turtles as seen below. There are some graphical glitches here and there like certain items flickering when they shouldn't be. Otherwise, everything is satisfying and sound. 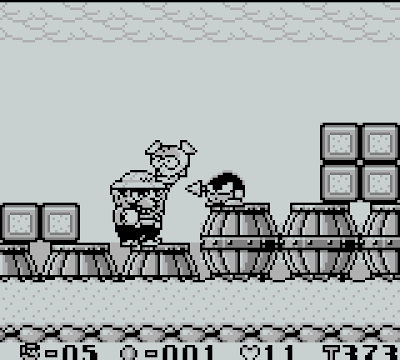 All in all, TMNT on the Game Boy Advance is a great, mindless beat 'em up that will last players a day to complete with two more difficulties to plow through and trophies to unlock. For those just wanting a fun, pick-up-and-play game, TMNT will be perfect for you. Those wanting something resembling the good old days of Turtles games, something more akin to Turtles in Time, you have a competent game here, too. Cowabunga and all that jazz. Ubisoft's official website for the game has unveiled new levels for the upcoming Smash clone made by part of the Smash Bros. Brawl, Teenage Mutant Ninja Turtles: Smash Up for Nintendo Wii and Playstation 2. Click on a photo to have it enlarged. What are SPC Quickies? They're paragraph-long reviews for games that don't really need a long review dedicated to them. We're talking about games like from the Virtual Console and other downloadable services. It makes little sense to score such games on the normal in-depth review scale, so instead quickie reviews will be scored from 1-5 with no decimals to worry about. This game is based loosely on the movie with only a few key scenes missing. The game's story could be described as Cliffnotes for the movie. 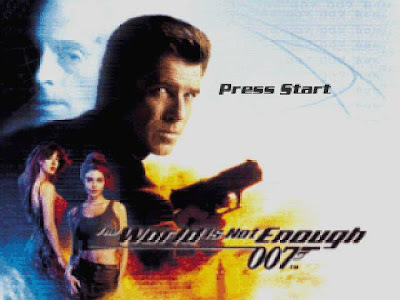 The single-player mode has three difficulties to plow through each with varied missions and objectives added depending on the difficulty chosen. The game feels very much like Perfect Dark which is high praise indeed. There's even unlocking new multiplayer content such as skins, arenas, and modes by beating missions under a given time. Multiplayer itself plays great with four players maximum (e.g. two humans and two bots), and it's quite fun to blast away one another or just blast away bots by yourself. 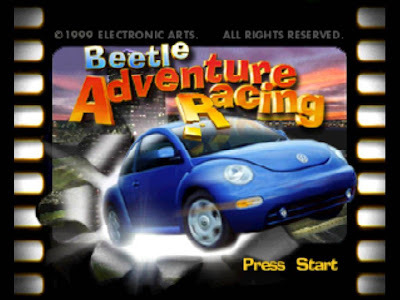 Beetle Adventure Racing isn't your typical racing game. There's only six tracks, but these tracks are highly detailed, long, and are littered with hidden shortcuts and paths to travel. The game rewards the player's exploration with point and bonus blocks that unlock continues as well as hidden game content. Multiplayer is a blast, and it offers up four player carnage via splitscreen. The only problems I have with the game are that the music is pretty poor and cups can take too long to complete. 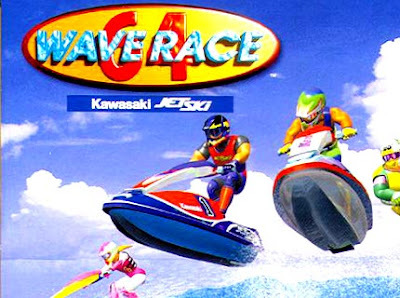 This title came out close to the Nintendo 64's launch, and it was way ahead of its time. The water physics to this day still hold up wonderfully as do the superb controls. Tearing across the ocean is a wonderful pleasure. 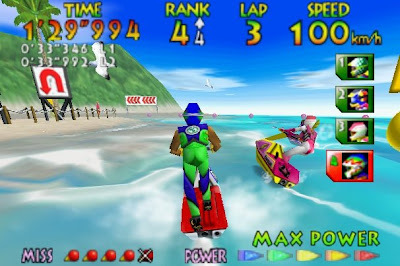 Each of the game's riders have their own stats, and each circuit has its own theme from sunset isles to ports filled with rough, unforgiving water. 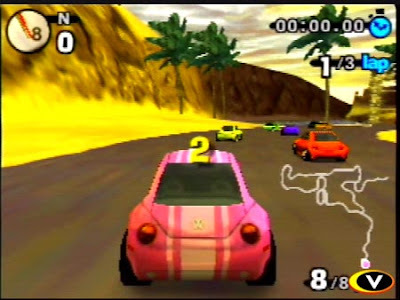 Each grand prix difficulty has the player jetting across the same tracks only with one new track added each difficulty. That can be repetitive, and I would have liked to see another track or two total. 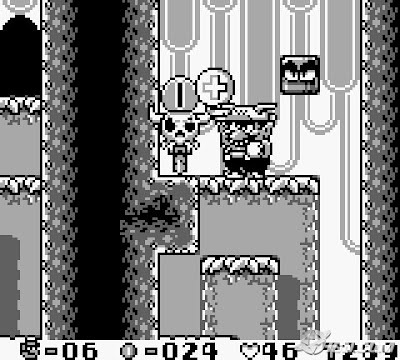 Wario's first full-fledged adventure, Wario Land: Super Mario Land 3 is where Wario the anti-hero came to be. He doesn't care about saving the world or rescuing a princess; all Wario cares about is treasure, treasure, and more treasure! The platforming is surprisingly type. Like Mario, Wario has his own special hats such as the rocketing bunny cap. To bring up the game's longevity, there's hidden treasure for Wario to obtain, secret level exits to uncover, and bosses to beat. Did you miss Volume One? Check it out here! If you recall, the following game was nominated for Best New Franchise and Game of the Year during my big, star-studded Best of 2008 awards. I still have my buzz from the afterparty! Read up on why Dead Space was nominated in this brand-new, fashionably late review. The PS1 was truly the golden age of the survival horror genre. 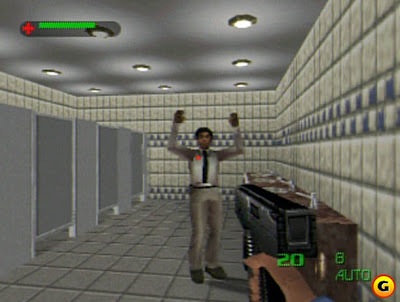 You had big guns like Resident Evil and Silent Hill, but you also had littler known titles like Clock Tower. Now we’re not seeing as much horror in the survival horror genre. Resident Evil 4 and 5 turned the series into a more action-oriented affair while Silent Hill has suffered in quality. 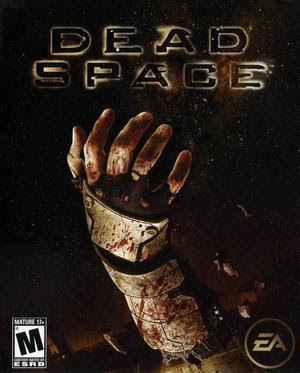 From EA, Dead Space is seeking to help revive the genre, at least on HD platforms. It’s decidedly pure survival-horror with gratuitous violence and bloodbaths for all. 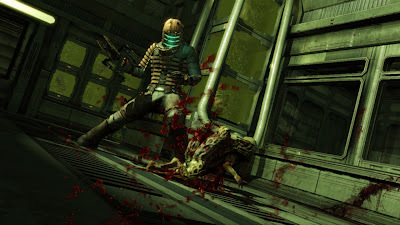 Will Dead Space give you thrills and chills, or is this new single-player game one that goes and blows? An engineer, Isaac Clarke, is onboard a repair ship heading towards the U.S.S. Ishimura, a mining hull. After being bombarded with asteroids, Issac's ship makes impact onto the Ishimura. What was a routine repair mission is now a desperate fight for survival. The crew is dead, some form of alien force has inhabited the ship, and the hope for escape is all but lost. 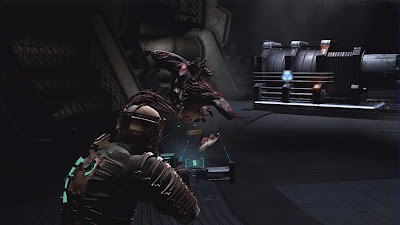 Each chapter of Dead Space showcases how the situation is becoming more and more hopeless. Cut-scenes are minimal throughout the game. The narrative is provided in-game while you have full control over Isaac giving the game a more scare-filled feeling. There are many moments where you will feel truly disturbed watching such as seeing a Necromorph tearing up a crew member with you forced to watch, seeing the crew members lose all rationale and start killing one another, and so forth for starters. The big mysteries of the game are where is Nicole, a possible wife or girlfriend of Isaac, and who are these creatures infecting the ship, and where did they come from? 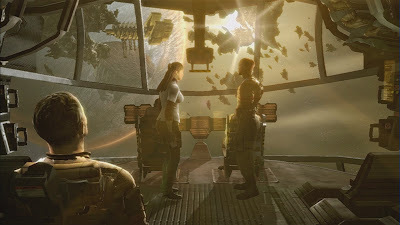 The opening scene of Dead Space. 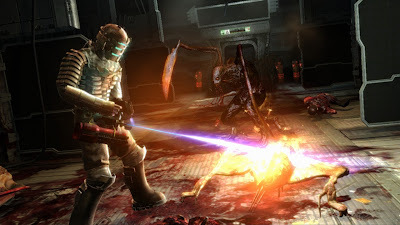 The core gameplay of Dead Space revolves around Isaac moving through the Ishimura, blasting away the necromorph threat infesting the ship. 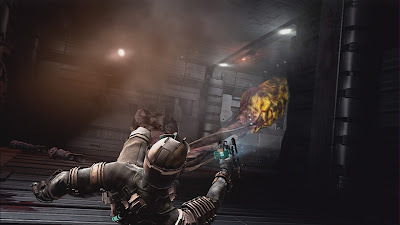 Dead Space plays like Resident Evil meets space (but not like Dino Crisis 3) only this time you can actually move while shooting. There are some attempts at changing things up, but they tend to fail such as an asteroid shooting mini-game around the fourth chapter. Like Resident Evil 5, item selection is done in real time which makes needing a med kit during a skirmish a very hectic and tense experience indeed. Ammo can be scarce in later difficulties (which there are four) bringing the amount of anxiety, as well as annoyance, to an all-time high. Each of the game's twelve chapters take place in different parts of the Ishimura. That doesn't mean areas don't overlap and have you revisit familiar areas of the ship, but that is to say there's little to no backtracking involved. If you get lost in the dark, you can click down the left analog stick to have Isaac's RIG suit point the way you need to go leaving getting lost a worry for other games in the genre. Isaac's suit also allows him to enter zero gravity and vacuum sections. Zero gravity sounds just what it's like. Isaac and enemies alike can walk on walls, floors, and launch themselves across the room when in zero gravity. Vacuum rooms require Isaac to pass through them quickly as there's no oxygen in these areas. A time limit of how much oxygen Isaac has left will be displayed on his suit as will everything in the game such as his health and kinesis power. Kinesis power allows Isaac to slow down pursuing enemies to a crawl or slow down a malfunctioning door which would otherwise smash Isaac in two or three bloody pieces. It also allows Isaac to pick up or hold various objects and even some enemies' projectiles, giving him the ability to toss them back with a push of a button. As you progress through the game, you find new schematics which unlock new items, weapons, ammo and upgrades for purchase in the shop. Each area has multiple shop machines where Isaac can buy and sell these goods with credits (Dead Space's currency) found throughout the ship's rooms-- some massive, some claustrophobic. There's several weapons for Isaac to use, the sniper rifle of the future, the pulse rifle, the limb-detaching plasma cutter, and the heat-inducing flamethrower to name a few. Each weapon has a second fire to double their usefulness, and each can be upgraded at bench stations using hidden power nodes. You can upgrade the power, accuracy, firing rate, and reload time of each weapon. This wasn't in the operations manual. What good are weapons if there's nothing to fire them on? Necromorphs are the cast of cretinous characters that prowl the Ishimura, and they can come in all shapes and sizes. Some are just truly terrifying and unrelenting, haunting players as they turn that corner only to be surprised by a sickle slash, cutting Isaac's head off like a knife to butter. Some are swift movers needing Isaac to be quick on his feet or else he’ll lose them (along with everything else), some can shoot projectiles from far away, and some have exploding sacs that when shot release an army of tiny creatures that when in a group are lethal. To avoid wasting ammo, you'll need to shoot strategically at the enemies' limbs to truly damage them. Each dismemberment damages them, and while they cower on the ground, Issac can give them one last curb stomp goodbye. The heat is on with the flamethrower. Dead Space is one of the most breath-taking games of this generation. The art design is fantastic as the Necromorphs really are unpleasant to look at (and listen to). You get a sense of dread visiting areas not knowing what's coming thanks to how suspenseful and terrifying the Ishimura is. Then again there's always the bloodthirsty creatures, too. A problem I see mostly with the game is that everything looks similar since for the most part, you're always on the Ishimura. Sound design is superb with the music crescendoing when an enemy pops up, or when things aren’t so crazy and you hear terrifying ambient sounds. Voice acting is terrific and performed in a believable manner. Case in point: the entire presentation package is spot-on. A great stress release-- stomping on corpses. Dead Space succeeds at borrowing the gameplay of Resident Evil 4, tidying it up a bit, and putting it into a brilliant stand-alone game. Survival-horror fans will love it, and those old enough to take on the ultra-violent action of the game will enjoy the game, too, despite a few flaws. Dead Space gets a huge approval from me– regardless of which of the three platforms you get it on. Spyborgs started out with a lot of hate. It had a "Saturday morning cartoon" vibe to it. Its life reminds me of Jet Force Gemini. It had three team members, and it also started out with the heroes as younger than the end product. Check out these new screens from one of my most anticipated games this fall for the Wii. Here's a direct link plus two new videos. Aiai and the gang are back with a more traditional Monkey Ball adventure-- no bosses, no jumping. It's all with your Wii remote or Balance Board this time around. It's already sounding very promising without even seeing any gameplay footage! Check out the premiere trailer for Super Monkey Ball: Step & Roll for Nintendo Wii. Hopefully it all turns out better than Banana Blitz! We just got finished with the 150th review here on SuperPhillip Central, Banjo-Kazooie: Nuts & Bolts for the Xbox 360. The game has a cool feature which I hope a lot of new games incorporate, the ability to take photos while you play. Come see some of my own photos below. If that seems too much work to click through each photo, check out the slideshow!